Throw Away Your Towel! NOW LOOK! Welcome to this beautiful space created for beautiful people with real lives and real experiences.It's an expressive space.Little filters but all truth from the heart. It's a space that acknowledges you and your heart.Its a space specifically for you.Because we are all alike. It begins at that place of acceptance. The only way to see your differences from that other girl as something special. See yourself as you are. No. Do not grin or cover the flaws. 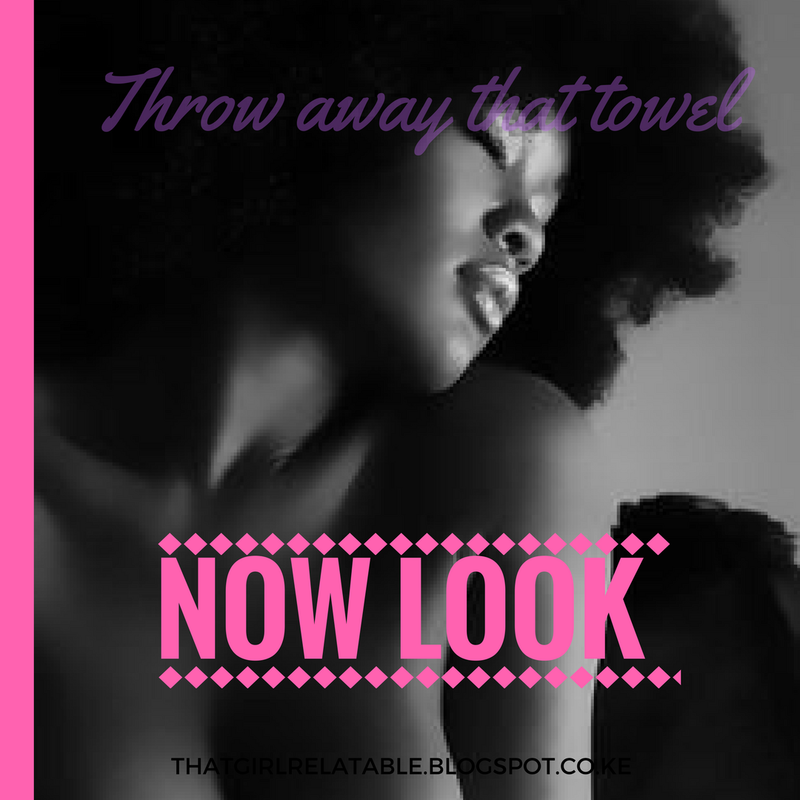 Throw away that towel. Now look. Love each part. Touch your body, soul, mind and spirit with a gentleness and kindness they deserve.I hear you.Its far from perfect.And it's okay.Love it perfectly.Submit to what it is now and give it the breath to be better. When you finally allow anyone to touch your body,soul,mind and spirit.Let them find that those places are already warm from your own gentle carresses,unashamed attention and love. See through windows and locked closets mirror our lives.We try to shut ourselves in.To hide our scars and deepest secrets.We do not want anyone to know who we are and where we really are.We disappear in ourselves and the notion that we are all alone. The wind carrying that wave of fresh air, life and rejuvenation is the people you look at right in the eye and close the doors of your life on.That GIRL relatable is free.Free to be and let be.She dances in as the wind blows her face and lets leaves of healing hit her face and receives life. She is vulnerable and open.She is seen for who she is and cherishes all that she wants to be.She can be leaned on.She is warm and free of knots.She understands the language of woman because her doors are wide open and her windows ajar.She is hopeful,not unscarred. She is that GIRL relatable.